With 18 000 employees in 79 countries, Mazars’ activity spans the globe, as does its brand communication and social media activity. But it is for this reason that developing a culture of thought leadership, through an employee advocacy program tailored to both regional and global needs, was never going to be an easy task. By launching dedicated, regional instances of the Sociabble employee advocacy platform, each of them propelled by a global vision, the company has empowered Mazarians the world over as thought leaders, while fully addressing the challenges of trust and authorization all regulated companies face when engaging employees as ambassadors on social media. "Targeting senior profiles enabled us to carry out an initial deployment for those who were already comfortable communicating in a professional capacity on social media, and aware of best practices." The Sociabble employee advocacy platform aggregates brand, third-party and user-generated content (UGC) onto themed channels, from which users can share on their own social media accounts. Available on desktop and natively for Android, iOS and Windows Phone, the platform offers a full suite of return-use mechanisms, gamification features, analytics and performance tracking metrics. To date, Mazars has launched dedicated instances of the Sociabble platform for France, Germany, the UK and Mazars Group, with the latter covering a total of 13 countries. Additional instances for the USA, the Netherlands, and Asia-Pacific are also in the pipeline. Mazars began its employee advocacy program by identifying those individuals within the organization who had the largest following, and therefore the greatest influence, on social media: for the most part, those in senior positions. For a company facing the same challenges on social media as any highly regulated organization, there were added benefits to this strategy. “Targeting senior profiles enabled us to carry out an initial deployment for those who were already comfortable communicating in a professional capacity on social media, and aware of best practices,” notes Othman Abdelmoumene, Group Social Media Specialist. Having selected Sociabble for its employee advocacy program, Mazars rolled out four instances of the platform: France, Germany, the UK and Mazars Group. In preparation for launch, administrators for each of these instances received a dedicated communication kit, complete with email templates that highlighted the benefits of employee advocacy at both an individual and a collective level, as well as a detailed PowerPoint presentation outlining the vision of employee advocacy at Mazars. Webinars were also held with platform administrators, in order to introduce them to the Sociabble platform and put them in the best position to drive user adoption in their region. "Our users really appreciate having easy access to approved, shareable content that comes from external sources, that relates to their work and that enables them to demonstrate expertise. The UGC functionalities are also very popular, as they allow employees to develop thought leadership by submitting pertinent content they themselves find on the web." On the Mazars Group platform, which covers a total of 13 countries, striking a balance of global and localized content was also crucial. Each user has access to a channel that is specific to their country, as well as a selection of global channels. These include channels that relate to the company’s areas of expertise, such as tax, financial services and real estate. Certain users also have access to a market watch channel, on which sharing functionalities are deactivated. 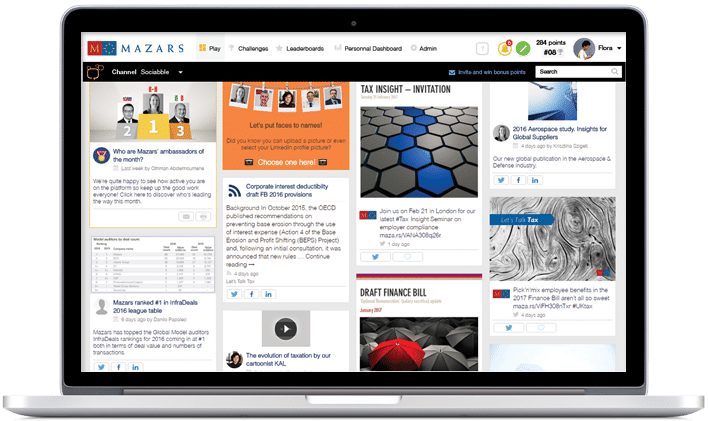 Recognized as a leader in employer branding, Mazars has also launched channels dedicated to recruitment and company culture. “For us it’s very important that employees can stay up to date with recruitment and employer brand activity,” adds Abdelmoumene. "Employee advocacy is essential for professional services companies like ours, as we don’t sell products – we sell the expertise of our people." 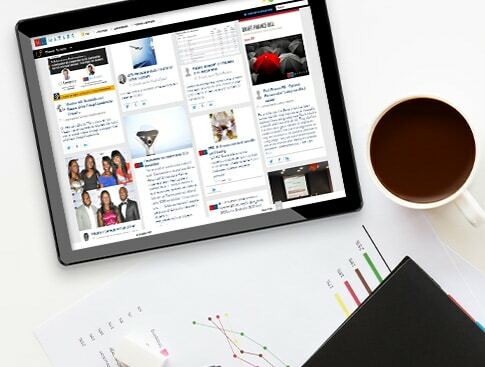 Mazars employees win points for their content creation and sharing activity on Sociabble, have access to leaderboards, and can track their progress via a personal dashboard that details the engagement generated externally on social media. Thought leadership is also acknowledged by the company. For example, on the Mazars Group platform, a monthly internal communication initiative and an announcement pinned to the top of the Sociabble interface are used to highlight top ambassadors, in recognition of their activity on the platform. 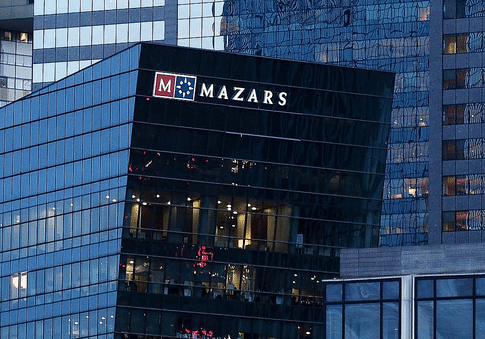 When launching an employee advocacy program, Mazars had two key objectives: to create additional visibility for brand content, and empower employees as thought leaders on social media. The company has identified results in both respects. With an overall user engagement rate of over 88% on Sociabble, the company has achieved a monthly reach of more than a million audience touchpoints. Moreover, the amount of content created by users on the platform is a clear indicator of the rate at which thought leadership has taken off. “Since launching Sociabble we have seen a clear increase not only in the amount of brand content that employees share, but also in the amount of new content that they create,” explains Abdelmoumene. The employee advocacy launch strategy applied by Mazars has laid the foundations for further development. “Launching for selected, influential users has enabled us to fine-tune our employee advocacy program, by testing what works and what doesn’t,” notes Abdelmoumene. Beyond launching additional instances of the Sociabble platform in the USA, the Netherlands and Asia-Pacific, Mazars’ long-term goal is now to engage all employees on the platform. Trusting employees to advocate for their company on social media is a challenge for many organizations, not least those in highly regulated industries. But Mazars has recognized that, in spite of this, it is a necessary next step. “Employee advocacy is essential for professional services companies like ours,” notes Abdelmoumene. “We don’t sell products, we sell the expertise of our people.” This mentality is the driving force behind employee advocacy at Mazars, where the thought leadership of individuals reinforces the expertise of the organization. Fill in your details to receive the full case study.